Now that the UAAP is the commercial success and celebrated sporting organisation that it has become, it makes one feel not just a tad foolish to recall that there were those of us who rather felt that leaving the NCAA was not unlike the end of the world. It was schoolyear 1980-81. It was the last year on earth for the semester at DLSU-Manila. Albeit we did not know about it at the start of the schoolyear, it was also to be the final year for the university as a member of the NCAA. Although my year of entry into the university was 1975, despite a year’s LOA and underloading for love of the beautiful game, I was also finally graduating. This has nothing to do with the story but just my way of thanking the Lord for sparing me from the trimester and allowing me to play in the NCAA in the final season. Those who watched Wednesday’s women’s volleyball finals on television might have seen this quick shot of young people dressed in various shades of green and blue happily sharing the escalator ride on the way up to the bleachers. The rivalry between the auld enemies has remained fierce; but contained mostly on the playing courts. The violent spillover to the bleachers which used to be part and parcel of the NCAA had become a thing of the past. My personal hypothesis is that this has been due largely to both universities becoming coeducational. If at all that was possible in the seventies when both DLSU and Ateneo were still in the NCAA, it was for young people in various shades of green and blue to be happily smacking each other’s faces. But then again, in those days, ingress and egress for the two universities’ sets of fans were sensibly segregated. By 1981, these acrimonious soirées with Ateneo were not even possible because the auld enemy from the far end of the metropolis had already bolted the NCAA. What happens when the face you love to hate suddenly vanishes from in front of you? You admit it to nobody; but you know you perversely miss that very face that you love to hate. Which was more or less how we all probably felt after Ateneo had had enough of the violence that plagued the NCAA and took off. For those of us who were left behind – and most especially those of us from the green side – things just did not feel quite the same. After Ateneo had departed, San Beda more or less took over as the league’s dominant basketball force. However, if you are from La Salle, something in your DNA instinctively taught you that San Beda was not the enemy. 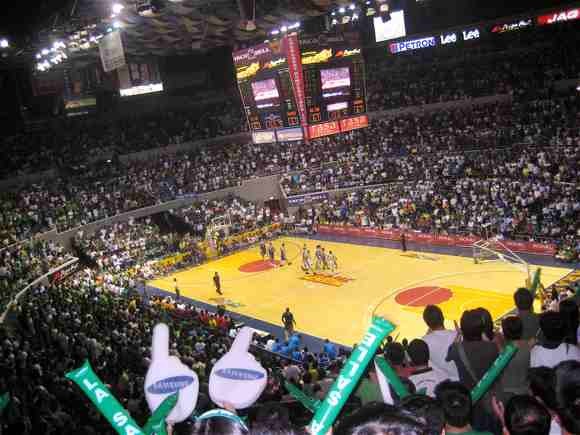 In fact, I have attended La Salle-Ateneo basketball games when San Beda students stayed behind in the bleachers after their team’s game and even called for La Salle cheerleaders to come over to their side to lead them in cheering against Ateneo. Nobody messed with Letran – excepting San Beda, the sworn enemy. Trinity was the school we prayed to God and all the saints that our basketball team would not lose to. San Sebastian was the funny school which copied the cheers of other schools and replaced the words with their own. Jose Rizal was the school everyone made fun of as the hopiâ factory; and Mapua, well, sometimes fought with Letran, sometimes with San Beda and sometimes with San Sebastian. In other words, there was nobody in the league who could make us look forward to a basketball game the way Ateneo could. For reasons that would make the Brothers and the Jesuits cringe, of course. I am not a hundred per cent sure now because memory after 32 years does get hazy, but I think it was a running battle with Mapua – of all schools – that influenced DLSU into leaving the NCAA and joining the arch-enemy in sporting oblivion. La Salle had a fairly good – if young – team. Franz Pumaren was a fresh-faced freshman; his brother Derek a sophomore. Richard Mendoza was also a freshman. Tonichi Yturri – who once sat next to me in an Economics class – had gotten better from the farm team. We were not yet championship material but were getting there. At any rate, I remember this game against Mapua which we won closely but which for some reason also angered the Mapua crowd. The problem, it seemed, was never with Mapua’s college students. The problem always was with the high school students – and one could always see them seated together in their black pants and white polo shirts. Now all La Salle fans knew of this ‘secret’ passageway from the Rizal Memorial Coliseum through the tennis courts, across the foot bridge over the small creek and back into the campus. This passageway prevented any direct confrontations with fans of the opposing school; especially after a contentious game. The problem was, that property where there is now a McDonald’s restaurant was still a parking lot used mostly by DLSU students. Mapua students angered by the result of the game rampaged along Taft and started throwing rocks at the cars parked; and when the owners arrived to find their windshields smashed, this led to running battles along Taft Avenue and Vito Cruz. It was both scary and fun, symptomatic of the testosterone-fuelled years of the NCAA. The street war, if memory serves me correctly, was by no means a one-off in the league but was definitely, for DLSU, the last straw. I was in the football varsity and one day soon afterwards, athletes of all other teams were summoned to a meeting in this large hall at the third floor of the La Salle Building. It was in this meeting that it was formally announced to all the athletes that, while DLSU was seeing the rest of the NCAA season through, it was withdrawing from the association thereafter. I remember that the announcement was met with anger and disappointment but also a sort of resignation to the inevitable. The overriding sentiment was that the participation of the other teams was being sacrificed on account of incidents that periodically happened mostly if not exclusively during basketball matches. It did not seem fair. The basketball team was probably informed ahead of everyone else and I do not recall that they were even represented at the meeting. I recall that there were some who even took exception to that. Some wanted to know if the university would be joining another league; and truth be told, in those years, the UAAP was the poor relation. I mean, I used to wonder whenever I passed by the Rizal Memorial when there were UAAP basketball matches why the member schools still bothered to send their bands when the matches were poorly attended, anyway. The answers to the question were vague. Yes, there would be attempts to ensure that the varsity teams had leagues to play in; but the when and where were not answered to satisfaction. A move to the UAAP was seen as something of a step down. The NCAA was the ‘glamour’ league. The UAAP, on the other hand, was merely the other league. But of course, crystal balls are for sorcerers and nobody yet had a clue that, in fact, the auld enemies would one day in the not too distant future reunite in the UAAP; and that the UAAP would one day become arguably the premiere collegiate sporting association in the country. At any rate, the late Brother Rafael Donato used to once say that he could not understand nor condone the rivalry between La Salle and Ateneo. There is little to choose from between the two schools, he used to insist. To him, the two universities are really of the same ilk.